Judi was thinking about doing some research at the mine as it is known to be haunted. Judi spent the day taking pictures of the area when she noticed something odd in the sky that was moving over the Mine area as she took her photos. She sent me the pictures which I immediately noticed was of a sky filled with feathered long chemtrails along with a strange looking cloudy Orb looking sort of gas like craft slowly moving over the Old Mine location. 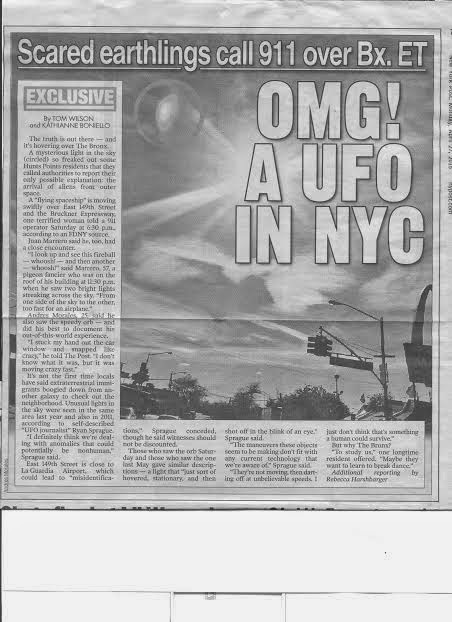 That night of April 28th my sister called me to ask if I had seen the article in the New York Post Newspaper about the UFO sighting over the Bronx New York. She said many people had witnessed a large Orb like UFO over the Bruckner Expressway area and someone had been able to snap a photo of the object. My sister brought over the article for me and I was shocked at once at the similarities to what Judi had just seen at the Old Mine. The article reported witnesses calling in a flying spaceship over 14th Street and Bruckner's Expressway about 630 PM as well as another report calling in a large fire ball swooshing across the sky. Another call reported a group of bright lights crossing the night sky at incredible speed about 11; 30 PM from a man looking at the sky while on the roof of his Bronx Apartment building, It was very interesting the way both sightings looked so much alike as well as the fact both obviously were flying in skies covered with chemical spraying clearly seen feathering out across the sky. The most interesting fact is that both events and photos were taken on the same day which was April 27th 2015. Now you think something funny was going on at Montauk Point? Where were you years ago? AMY, IS A WITCH AND DISCUSSES HER PAGANISM WITH ME!